A crispy, crunchy homemade hash brown cup loaded to the brim with ooey-gooey melted cheddar cheese, chunks of juicy smoked ham and a soft-baked egg on the top. 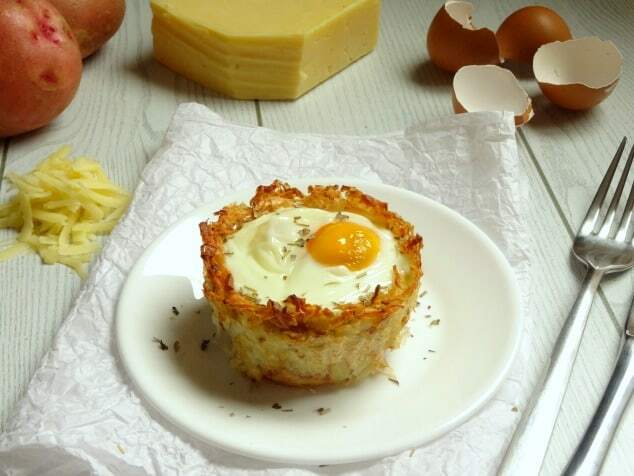 These Monte Cristo Hash Brown Breakfast Cups should definitely be making an appearance at your breakfast table this weekend! How do you like your hash browns? Soft and chewy (um, no) or crisp and crunchy (yes!) I hope you’re the crisp and crunchy kind of hash brown person, because that’s the only way hash browns should ever be served. My boyfriend loves them when they’re soft, but soft hash browns are just raw hash browns to me. And no one wants to eat raw potato. Although that same boyfriend once did eat a giant dessert spoonful of raw grated potato when he thought it was some kind of tuna salad. I totally know how to pick ’em, right? But anyway, if you love crispy, crunchy, golden brown hash browns then you’re in luck because that’s exactly what you’re getting today! To ensure these hash browns are the very best they can be, you need to bake them on their own first without stuffing them with the delicious fillings. Then when they’re just getting to golden brown perfection, add the cheese, ham and egg and cook for a final 15 minutes. These babies do take about an hour to make from turning on the oven to sitting down to eat, but the wait is totally worth it. Set aside an hour on your calendar to make them this weekend! 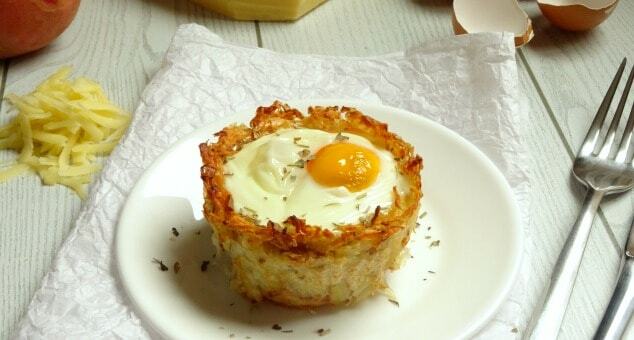 From the outside, these cups look like ordinary hash brown breakfast egg cups with just potato and egg. But they are oh-so much more than that! Slice through the centre of one and you’ll reveal long strands of melted cheddar cheese (extra points if you can get your hands on a smoky cheddar cheese!) and juicy chunks of quality ham (or crispy bacon!) which go so well with the crunchy potato and soft-baked egg that you’ll swear you’re in breakfast heaven. Can’t get enough of breakfast cups? Try these breakfast egg cups made with toast or these healthier broccoli cheese hash brown egg cups. Preheat the oven to 400F/200C and grate the potato with a cheese grater. Leave the skin on for added fibre! Pile the grated potato onto a clean kitchen towel and scrunch it into a small ball. Squeeze as much of the water as you possibly can out of the grated potato. This is how you'll get crispy homemade hash browns! Mix the dry grated potato with the olive oil, salt, onion powder and garlic powder in a small bowl. Grease a 1 cup ramekin (like this one) with a little extra olive oil and stuff it full of the grated potato, creating a cup-like shape. Bake in the preheated oven for 30 minutes, until golden brown. Remove from the oven and layer the grated cheese and chopped ham into the bottom of the hash brown cup. Carefully crack the egg on top of the ham and place back into the oven for a final 10-15 minutes, until the egg white is cooked and the egg yolk is soft or hard - however you like it. Remove the hash brown cup from the ramekin and serve straight away whilst hot. These look so good, I want to make several and either eat them for a few days or pop them in the freezer for a quick toaster-oven meal. Have you tried that? I would also add some peppers, mushrooms and/or onions sauteed while the potato cups are cooking. Hi Jennifer! Thanks so much for stopping by. You can definitely store these egg cups and warm them back up in the toaster oven until they’re piping hot and crispy! If you pop them inside an air-tight plastic bag or container, they’ll keep in the fridge for up to 5 days or in the freezer for up to 6 months. Adding peppers, mushrooms and onions sounds amazing. I think I’ll give that a go myself next time I make them!